We’ve been keeping a fairly close eye on this tree. It’s tall and when its orange flowers started budding we could see them every time we looked out the window. I was just waiting for the flowers to start opening — and this weekend my watchfulness was rewarded. 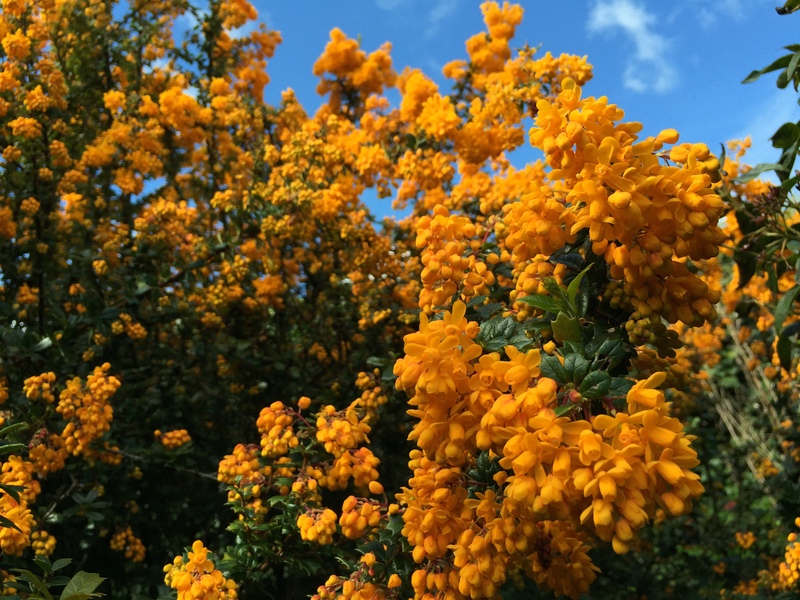 We’re pretty sure this tree is a Berberis darwinii, or Darwin’s barberry. We got excited at that discovery, wondering about the tree’s fruit. Berberis vulgaris is another barberry species that produces zereshk, a sour dried fruit that’s used in a tasty Iranian rice dish called zereshk polo (nomnomnom). I’m not sure what the Darwin’s barberry will turn out like, but despite our freezer overflowing with zereshk I’m going to watch for it so I can give it a try.